There are many different kinds of Minecraft players, but really, you can lump everyone into two groups. Either you’re a miner, or you’re a builder. The miners are playing the game to collect various resources, explore the map, and generally get into dangerous situations. The builder meanwhile, takes materials and creates fantastic structures, sculptures, castles, giant flaming phalluses, and whatever else. These two kinds of players work very well together, the builder being supplied with rare and useful materials to create with, and the miner having a kicking place to sleep and a place to store all the spoils of adventuring. But this is not always a harmonious relationship. Because when a miner comes home in the middle of the night, he’ll often bring home a little more than just iron ore and flint. Tell me about it. Hate that guy. I would say there are three types myself; the two you mentioned and one type who just really likes running around after dark and fighting monsters. Thanks to a few mods I have, I will make it dusk when morning arrives and hack and shoot everything that goes bump in the night. Don’t get me wrong, I love me some digging. Monster hunter… yep, I’ve never played with anyone like that. Three it is. Is this social commentary about American gun control policy? If not I don’t get it. If it is, I don’t get it. 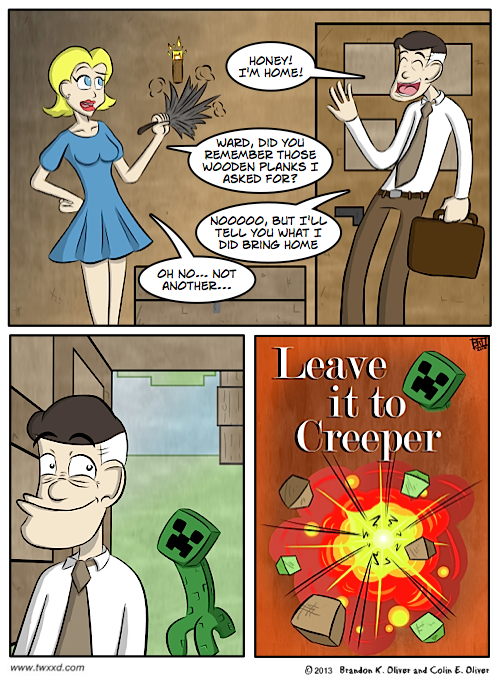 I believe it’s a subtle reference to how the Castle Doctrine has evolved since the implied time period of the comic. You’re both wrong. It’s Twilight fan-fic. Woa. Minecraft seems like a complicated place. For a place made of blocks, yeah, it really is :). Yay! Twilight ! They’re all so dreamy and hunky!